Toronto has been a giant building site the last few years, but finally, after an interminable wait, several major projects are due to wrap up in 2015. The Spadina line extension and the Eglinton-Crosstown LRT might still be some years away, but the new year will bring several transit upgrades, including the Union-Pearson Express and a Leslie streetcar yard. Elsewhere the first portion of the West Don Lands will be unveiled during the Pan Am Games and Queens Quay, for so long a tangle of construction hoarding and closed lanes, will finally reopen in its new, improved format. 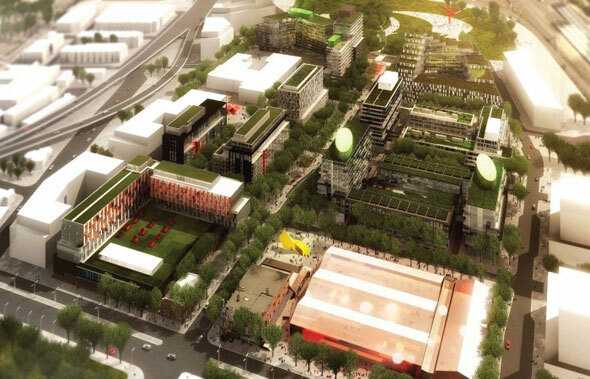 Here are 5 major Toronto projects to finish in 2015. The fare prices might be eye-watering for anyone used to paying TTC fares, but Toronto will get its long-awaited downtown-airport rail link in 2015. The line will run from a dedicated platform at Union Station to Pearson via Bloor and Weston GO stations. Each train is fitted with wifi, luggage racks, electrical outlets, and departure information screens. Service will run every 15 minutes starting in the Spring. 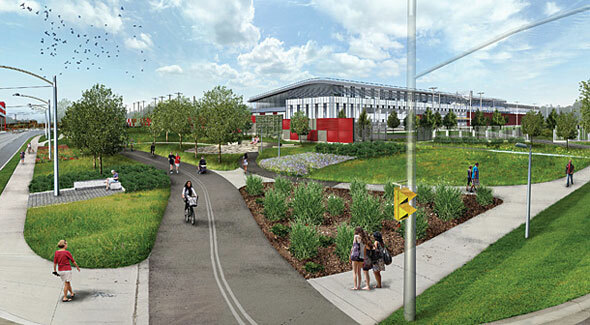 A large portion of the West Don Lands will come back to life during the Pan Am Games in the summer of 2015. The athletes village, which will be centred around an eastward extension of Front St., will be refitted for residential and commercial use following the event, with streetcar service beginning on the new Cherry St. spur. Corktown Common, the new park on the eastern edge of the neighbourhood, will see more use, too. 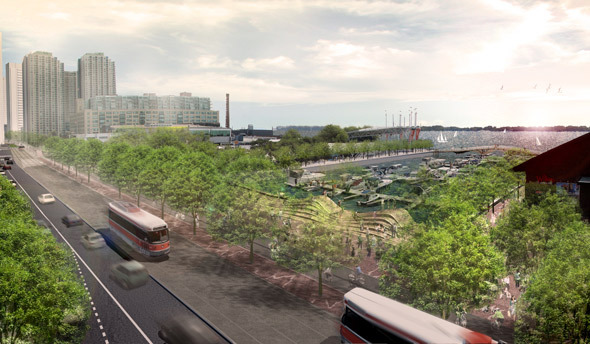 Waterfront Toronto's overhaul of Queens Quay is far more than cosmetic. Completely demolishing the street, including electrical, water, and streetcar infrastructure, has allowed the city to begin from scratch. In late 2015, when the project due to be finally complete, there will be widened granite sidewalks, an improved transit right of way, upgrades to the Martin Goodman Trail, and a new waterfront promenade. Best of all, the Spadina-Union streetcar link will be return. 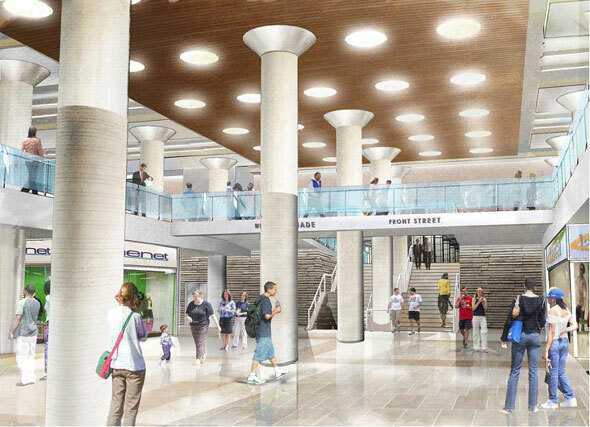 Toronto's main railway station has been a confusing and unsightly construction site for years, but in 2015 the $1 billion revitalized subway platforms and GO concourse will officially re-open. Workers have been excavating a new basement retail level, cleaning up the dingy train shed, and improving the overstretched subway connections, including adding a new platform. The massive project is due to wrap in the last quarter of 2015. Starting next year, Toronto's growing fleet of low-floor streetcars will be stored at a purpose built facility at Lake Shore and Leslie. The "barns" were due to be finished this year, but overruns have pushed the opening date back several months. When the facility opens there will be storage space for 100 streetcars and 30 maintenance bays. The yards at Roncesvalles and Greenwood will house the remainder of the 204-vehicle fleet.